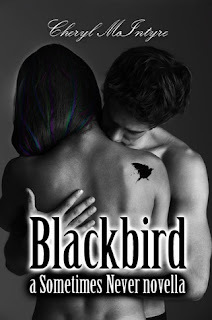 Hello and welcome to our stop on the Sometimes Never & Blackbird Blog Tour hosted by Good Choice Reading Promotions. We have our review and there's a giveaway for everyone to enter. *This is a mature young adult. Recommended for 17+ due to sensitive subject material, harsh language, and sexual situations. Her life revolves around four things: family, music, books, and really bad scary movies. If she doesn’t have a kid on her hip, an iPod in her hand, or a laptop in front of her face, it’s one of those rare moments when she’s actually sleeping. 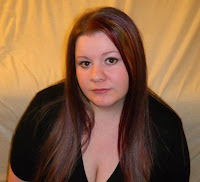 You can follow her author page on Facebook where she lives part time. On Goodreads, which is like crack for avid readers. Or on Twitter, though it’s rumored she has yet to master the art of tweeting. I have been reading a lot of New Adult titles in 2013 and I have begun to notice a pattern in many of the contemporary romances. There is a hot tough guy and a pretty girl, they meet, develop feelings and discover they share a common denominator: they're broken in some way and when they get together they are happy/whole. This is okay for a while but when I keep reading the same type of story, it becomes formulaic. Sometimes Never does follow this formula and I need to say the characters the author created kept this story going for me. Sometimes Never is told in the alternating first person point-of-view of Hope and Mason. Both are seniors in high school and Mason is a transfer student. One his first day, as soon as he gets out of his mom's car, he notices this girl and realizes he finds her beautiful. Within minutes he walks into an encounter with said girl and has to join in to help her. She gets into trouble and Mason doesn't see her for the rest of the day. Being a nice guy, Mason helps out another student from bullies and is befriended by the guy only to find out said guy is named Guy and he lives with the girl Mason thinks is beautiful. He goes to her house and it's instant attraction/love. Yes, the formula is apparent and yet I have to give the author kudos for her writing and the interesting cast of characters she has created which kept me reading. I liked both leads, Hope and Mason, and really liked Guy and the foster family set-up Hope had. Even Mason and his younger brother, Kellin, had a good rapport with their bartender mom. The family dynamics and Cheryl McIntyre's style of writing grabbed me, made me a fan, and also helped prove that formulas can be good when they rise above the basics and change things up. Both characters had traumatic pasts they need to deal with and their feelings for each other just may be what they need to begin recovering/fix them and make them happy. I wasn't hooked on the quick love aspect of Sometimes Never but after spending time with Hope and Mason I understood their motives and needs. When I first saw this cover, I thought it was erotica. I don't care for the cover and don't feel the couple truly portrays Hope and Mason.